The bully breeds are just the best. They may get some bad press, however, it’s all in how you train your dog! Pitbulls make wonderful companions in the right situation and with proper socialization and nutrition. To that end, I’m going to review the best dog food for pitbulls today. The term pitbull refers Staffordshire Bull Terriers, American Staffordshire Terriers, American Pitbull Terriers, and sometimes Bulldogs. Pitbulls require more protein than other breeds. So, I’ve taken that into consideration here. Is any of the brands of dog food below better than what you currently feed your dog? I’m all about doing anything I can to make your dog healthier and your life easier. Therefore, I’ve done the legwork for you here. The Best Food For Your Pitbull? What’s The Verdict? First, I’m going to tell you how to choose a high-quality dog food. Your dog will benefit from eating certain ingredients. Other ingredients could harm your dog. So, If you are wondering about the best practices for feeding your dog, keep reading. The Association of American Feed Control Officials (AAFCO) establishes regulations for dog food labeling. So, You can learn a lot about a brand of dog food by reading the packaging. ​Dog food labels that advertise a single ingredient must contain 95% of that ingredient which does not include water. Additionally, the same rule applies to combinations of ingredients. For example, the food labeled beef and potatoes must contain 95% beef and potatoes. You may already know that ingredients listed first on a label represent the majority of the contents of the food. However, did you also know this distinction is made according to weight? Therefore, ingredients that are very moist, such as meat, should show up at the start of the ingredient list. Are you worried about the grain content in your dog food? Don’t let the hype terrify you. Let me explain the concept behind dog food with grains. High-quality pet food will have the AAFCO seal of approval. This seal signifies a balanced, complete food. Additionally, you should combine this tactic with what we’ve learned about ingredients above. Therefore, pick the food with a single meat source and as few ingredients as possible. If grains are on that ingredient list, it’s ok. Linda Arndt is a professional, great dane breeder. Therefore, she does not recommend a grain free diet for any puppies or large breed dogs. You should pick a dog food with at least 20% protein for your pit bull pupp﻿y. There are several on the market, and I will review them specifically below. Your pit bull needs more protein to build muscle mass. This is particularly important for puppies. This dog food is pure luxury. If you want to pamper your pet, choose this food! Orijen dog foods are between 70-75% meat. They are also high in multiple, high-quality sources of protein. This gives the food a superior amino acid profile. Additionally, they contain only 18-22% carbohydrates. 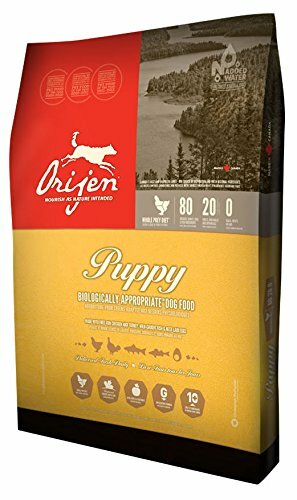 The ingredients in Orijen dog food are all fit for human consumption. The meats Orijen uses contain no antibiotics or growth hormones. Orijen uses a special processing technique at a low temperature. This process depletes fewer nutrients from the food. This food also has a great ratio of omega-3 to omega-6 fatty acids supplied by fish and fish oil. The fish used in this food are wild-caught. They are tested for environmental contaminants such as mercury. Finally, none of the ingredients in this food contain dangerous preservatives like BHT, BHA, or ethoxyquin. This food occasionally causes soft, smelly, and runny stool in dogs. Some owners report that their dog had more bowel movements. Of course, every dog is different. The company that makes Orijen food also makes Acana dog food. Acana has many of the same benefits. It costs slightly less than the Orijen food. Like Orijen, Acana is also grain-free. However, Acana is marginally higher in carbs and slightly lower in protein. Acana food contains three meat sources versus Orijen which has five or six. Acana food also contains two high-quality meat sources instead of the four in Orijen. Additionally, this food contains Angus beef, Yorkshire pork, and Suffolk lamb. This meat was all raised on farms in Kentucky. Taste of the Wild is another all-natural human-grade dog food. It contains wild game meats that are also hormone free. Taste of the Wild does not use meat exposed to antibiotics. Sweet potatoes are the main source of carbs in this food. This is healthy because sweet potatoes have a lower glycemic index when compared to white potatoes. They also contain antioxidants. ​The omega-6 to omega-3 fatty acid ratio is 9.3:1. This isn't ideal. You can combat this by giving your dog supplemental fish oil. Please check with your vet before doing so, however. 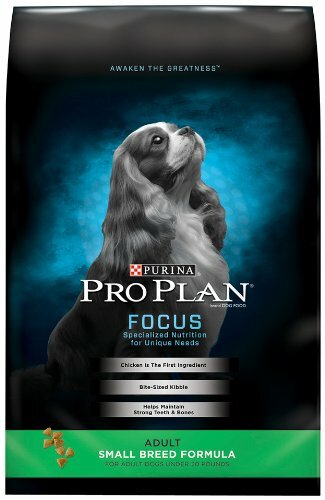 Purina Pro Plan Focus Dry Dog Food is full of high-quality protein. Chicken is the first ingredient. Additionally, this food contains natural sources of Glucosamine. Glucosamine will support proper development of cartilage and joints. Purina Pro Plan also contains fish oil with omega fatty acids. This supports your dog's brain and vision. It is rich in antioxidants, calcium, phosphorus and other minerals. These nutrients support your dog's immune system, teeth, and bones. Some owners note a lack of consistency in the size of the kibble. This can make a difference to your dog. This food also contains corn gluten which puts some owners off. We learned earlier that most vets approve grains in the diet of your dog, but corn is controversial among pet owners. Use your best judgment when picking the right food for your dog. You can watch for any food sensitivity if you introduce new food slowly. Canine Caviar is a single meat source food. It is 100% grain free and made with human grade ingredients. The venison in this food is free range. It comes from New Zealand and lives without hormones, antibiotics, or exposure to pesticides. Canine Caviar guarantees that this food is 100% GMO-free. Finally, the cooking method of this food is unique. It is only cooked for six seconds. This ensures the nutrients remain intact. The nutritional breakdown of this food is 34% protein and 20% fat. It has higher omega-3 levels (2.7%) than most comparable food. The omega-6 to omega-3 fatty acid ratio is 1.5:1. Additionally, this food includes borage oil, primrose oil, and gamma-linolenic acid (GLA). This is an outstanding fatty acid profile. This food gets great reviews. I am surprised, however, that it contains garlic. Garlic is on the list of toxic ingredient﻿s for dogs. That being said, some experts suggest that you can prepare garlic in a certain way and feed it to your dog. It is up to you if you want to take this risk. When in doubt, call your vet for answers. Now it’s time for me to make my recommendations. Before I do, I want to acknowledge that all of the foods I have listed here are good choices for your dog. That being said, I would recommend the Purina food if you are on a budget. If cost is no object, the Acana food is an excellent choice. It is whole food based. Additionally, it contains high-quality protein sources which are important for pitbulls. I hope this review helped you in some way! If it did, please share this with your friends. If you have a favorite food that I missed, let me know in the comments. I’m sure all of the readers will be happy to learn more from you about the best food for pitbulls.